While I have spoken before of the dread Acute Follicular Seizure, until now I have not been able to present photographic testament of the results. This poor gentleman had been sorely affected as some point in his past; the wispy tips and contorted growth patterns are clear indicators. While lucky that it was not severe enough to produce baldness, the mustache will never be the same. Still, he wears what cruel nature has inflicted upon him with a full measure of dignity. Huzzah, sir! i confess that i think i am suffering a similar malady. i have the same symptoms. what's a man to do? methinks that curtailing the length of the mustache would fluff up the remaining hairs, not unlike grooming ones pillow upon arrival of guests. I can tell by your impressive blogsite that you are an expert on 19th century mustaches. 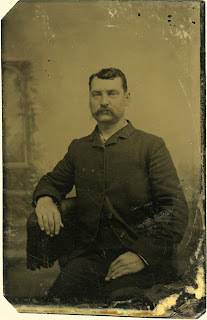 Being a Temporal Anthropologist studying the Victorian Age, I had to grow a mustache for my work. I know it's not much, but it did take a long time to grow. Do you feel it is period enough? If not, what would be your suggestion? You can see my photo at Wendell Howe Blogspot. Please don't comment on the haircut. It was done by a barber in Liverpool in 1887, who I think needed glasses.